It is a method of transferring design engraved on the brass to a sheet of paper by means of rubbing it with a special hard wax crayon (heel ball). A variety of colors is available in the paper and the wax to suit individual taste. Hell ball was perfected in the 1830’s, a mixture of bees-wax, tallow and lamp black. It was originally called cobbler’s wax; but as the shoemakers held a ball of it in the heel of their hands to wax the thread as they cobbled away, it was known as heel ball and still is. The formula remains much the same, refined somewhat, made in colors other than black; gold, silver, and bronze (or copper), and others. Several colors of paper can be used; however black, white and metallic gold and silver are the most popular and successful. A very high rag content paper, rather than wood pulp, is ideal as it does not yellow and become brittle with exposure and age. It is most important to insure the correct type and weight of paper utilized. Weight should be around 70 grams per square meter. At the rink of over-simplification, the initial process can be compared to the familiar penny and soft-lead pencil application. A sheet of the right size and quality paper is stretched over the brass, fastened securely with masking tape, and the heel ball is rubbed with stead strokes and a firm pressure over the brass. Thus the design is transferred from the brass to the face of the paper. When completed the rubbing is polished, removed from he brass, and cleaned up. From the beginning of time men have comforted eminent people with inscriptions and effigies. Stone was used for centuries, but it was difficult to work and eroded with time. In the 13th century a brass alloy called latter was developed which could be engraved in beautiful detail and was almost impervious to wear. At first, only the wealthy and influential — mostly knights and other military figures — were commemorated in brasses. 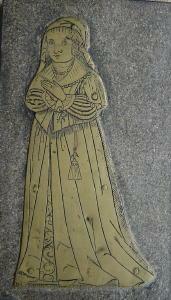 The earliest civilians depicted on brasses were women, the wives of the armored knights. By the middle of the 16th century the range extended to merchants, landowners, lawyers, clergy and scholars. The art dies out in the middle of the 18th century. In spite of the ravages of time the looting of religious objects during the Reformation, there remain in the churches of England some 8,000 commemorative brasses. The Victorians developed the art of brass rubbing. Clergymen in particular found it a way of preserving a record of their church brasses and if decorating the high walls of their vicarages with inexpensive elegance. Brasses were a rich source for scholars of period costume, armor, heraldry and ancestral family life. The rubbings brought out detail not easily discerned in the brasses, and could be collected in a library for convenience. Since World War II, Americans visiting England have delighted in discovering brass rubbing, and thousands have spent untold hours seeking out the small church with the unusual or particularly beautiful brass, obtaining permission from the vicar, and then kneeling on a cold stone floor to so the actual rubbing. No doubt this was good for the soul but hard on the knees, and it is no longer necessary. Many remember Paul Harvey and his quip, "and now for the rest of the story” Here is St. Thomas' story. When the church of St. Martin closed in Lancaster, and the Church's things were being disposed of, we found the remains of a total art program in the closets. The Program was a Brass Rubbing class that had been taught several years ago, and all of the necessary things had been left behind when the teachers left. St. Thomas came into ownership of the material recently and is in the process in setting up a Brass Rubbing Program. We are being mentored in this endeavor by St. Lukes's Church in Long Beach, California who have been doing this as a ministry for the past 32 years. We have visited St. Luke’s, listened, learned, returned and are preparing to offer it to the Church, to the Community of Ennis and to the Diocese of Dallas. As the program develops we will not only offer the program in Ennis but will bring a class to your Church or small group. The program will be up and running by January 2019. If you are interested, the information about is below and you may contact us anytime.